The compound motor consists of part of the field winding connected in series and part of the field winding connected in parallel with armature. It is further classified as long shunt compound and short shunt compound motor. In this type, the shunt field winding is connected across the combination of armature and the series field winding as shown in the Fig. 1. Let Rse be the resistance of series field and Rsh be the resistance of shunt field winding. The total current drawn from supply is IL. 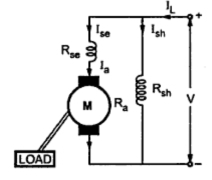 In this type, the shunt field is connected purely in parallel with armature and the series field is connected in series with this combination shown in the Fig. 2. The entire line current is passing through the series field winding. 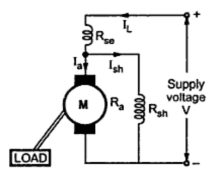 Now the drop across the shunt field winding is to be calculated from the voltage equation. i) Cumulatively compound motors and ii) Differential compound motors. Note : If the two field windings are wound in such a manner that the fluxes produced by the two always help each other, the motor is called cumulatively compound. If the fluxes produced by the two field windings are trying to cancel each other i.e. they are in opposite direction, the motor is called differential compound. A long shunt compound motor can be of cumulative or differential type. Similarly short shunt compound motor can be cumulative or differential type.